· One-button take-off / landing/return function: avoid lost aircraft and push the plane back with the push of a button. 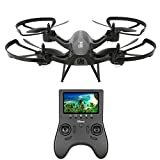 · 5.8G high frequency image transmission and 720P camera will give you clear and bright aerial images and videos.Mode 1 and Mode 2 can be freely changed so you can choose one you want. · Colorful LED lights to fly in the dark. Highly durable cell to absorb shock and shock. · Headless Mode facilitates flight: Once the fuselage direction cannot be recognized, you can enter headless mode to continue the flight.